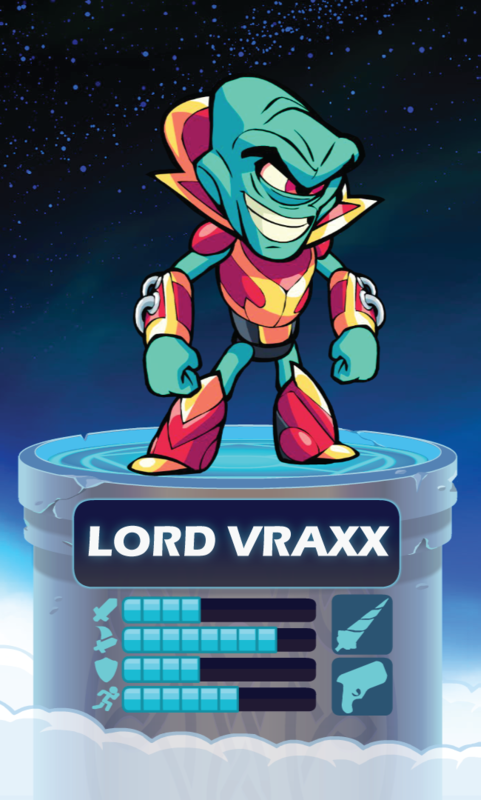 “Lord Vraxx we adore thee. So strong and smart and great. Don’t shoot or fry or jail us. Don’t crush or immolate. Don’t chop us into pieces. Don’t throw us in the bay. Vraxx’s father was Governor-Tyrant of the Ice Planet Roldakk-9, and young Vraxx spent his childhood like most Zhaktari noblespawn – in a vat. As a cadet pilot in the Zhaktar Academy for Conquest and Subjugation, he excelled in space dogfighting, spacedog fighting, judging the weak, and planetary immolation. In Valhalla, Vraxx’s naked ambition and unremitting scheming is reassuringly constant. He is contemptuous of heroes who are not royalty, and only Nai, Bödvar, Hattori and Orion are worthy of direct address. Vraxx’s most prized possession is everything he owns so no touching.